There are a few orchids that produce culinary fragrances --vanilla, lemon, chocolate, coconut, white cake icing, wintergreen, cilantro, to name a few--fragrances that I usually associate with the kitchen rather than the greenhouse. 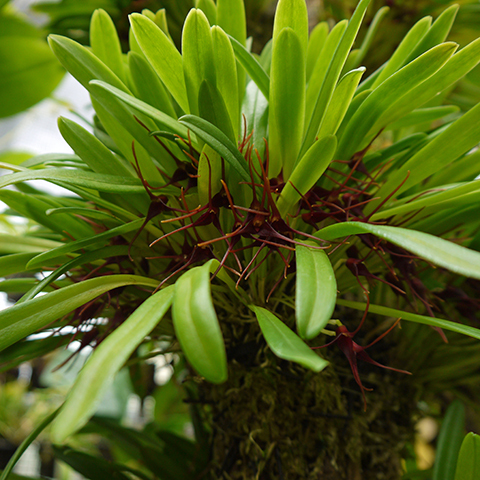 Masdevallia herradurae is the only orchid in our collection that produces a fragrance like cinnamon. Red Hots, to be precise. When tiny Masdevallia herradurae appeared among a new shipment of plants last year I was instantly charmed by the handful of exquisite flowers that were visible. At the time I didn't bother to investigate the fragrance. 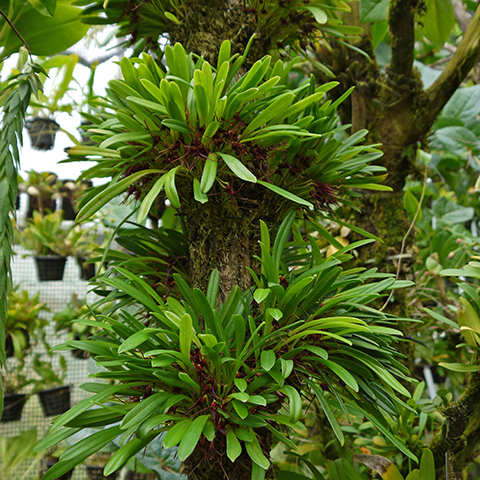 Matt Richards then installed our Masdevallia herradurae plants on a Sassafras branch in the Tropical High Elevation House. Since then I have patiently watched as they produced their first tentative roots, a new flush of leaves and finally, buds. I have been eagerly anticipating their first flowering. At last the flowers are open. Each tiny plant has produced between 50 and 75 flowers. The branch has hundreds of tiny flowers. Masdevallia herradurae is a magnificent bloomer. What was totally unexpected about this burst of tiny fireworks was the strong fragrance of cinnamon. No other Masdevallia in our collection is strongly fragrant of anything (at least to me), let alone something tasty. I have fallen in love with this orchid all over again. Masdevallia herradurae is easy to grow. 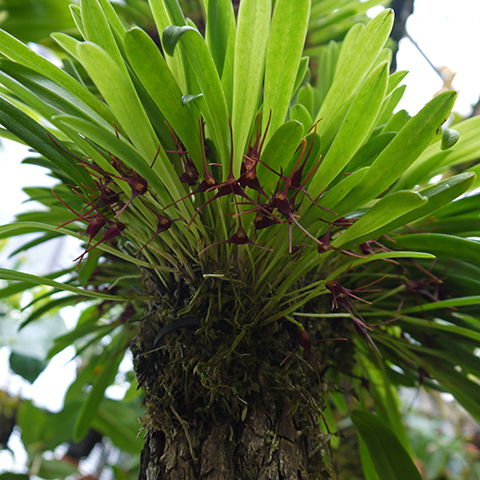 It grows over a fairly wide elevational range in Colombia and Ecuador: 500 to 2100 meters. I suspect it would adapt well to intermediate temperatures in a humid environment. If you're growing Masdevallias under lights you may want to give this terrific orchid a try.